Hello and welcome to the online home of PSD Kennels and K-9 Training Academy. We here at PSD are both Honored, and Humbled to be given the opportunity to serve this country by providing some of the finest German Shepherds, Dutch Shepherds, and Belgian Malinois via our Trained service dogs and puppies available for sale. At the Heart of our Operation is the Desire to provide European Quality Service and working dogs to Police Departments Military units and Private sector buyers in North America. PSD Kennels has been importing, training and Breeding working dogs for the Police Departments and Elite Military units the world over since the 1980s. In addition we provide dogs for personal protection to the private sector and have sold many dogs to celebrities, executives, and sports stars for the protection of their homes and families. Great group of GSD puppies for sale. 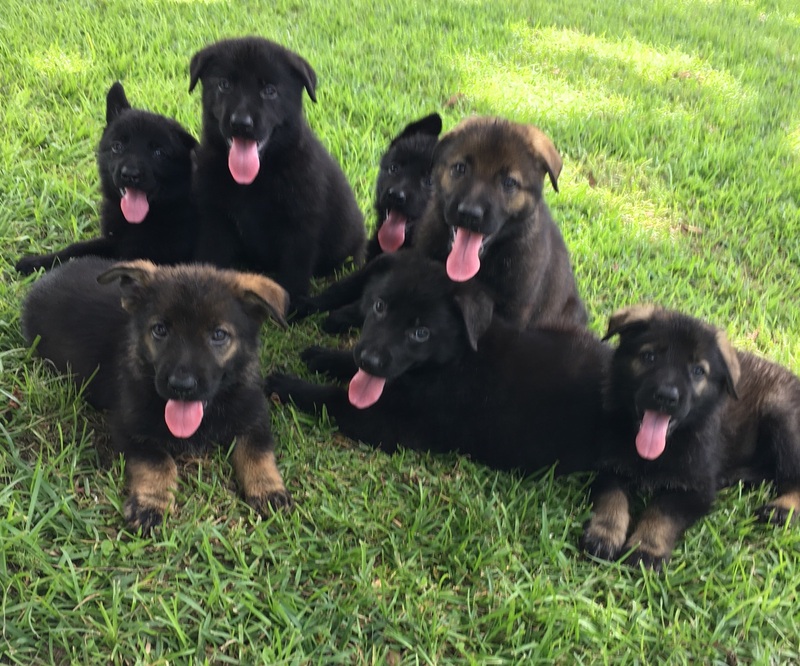 German Shepherd puppies for personal protection and service work. Our dogs have assisted soldiers by detecting explosives and search and rescue as well as providing protection to their handlers and their units in some of the harshest Theaters imaginable. K-9 Graduates of PSD training academy are deployed on some of the toughest streets in America where they work every day and night to protect law abiding citizens and their Officers by locating, pursuing, and apprehending criminals. as well as finding drugs and detecting explosives. These dogs are some of the toughest, most determined, driven dogs available anywhere in the world. and it has been our HONOR and our Pleasure to provide them to Military and Police Departments worldwide. We couldn’t be more proud of both our K-9 PSD (Police Service Dogs) and MWD’s (Military Working Dogs) and the Soldiers and Police Officers that put it all on the line every day to secure our freedom. We Thank you all for your service! As a Military family as well as a Police Family we have a keen understanding of what exactly that service entails. Training Videos and much more in the works! • How do I crate train my puppy and why does my puppy NEED a crate anyway? • My puppy bites! What do I do? • Do I allow the puppy on the couch? Why not? This video will be available to purchase or instant download for a small fee if you did not purchase your puppy from PSD Kennels. We are planning many awesome training videos showing exactly how we train dogs for police departments and Military use as well as personal protection dogs. It all begins with the Puppies. Stay tuned for more information on the upcoming videos! We are Planning a special column called “Ask the Experts” which will enable the public to submit their puppy or dog training questions via video or email and we will get our founder and Head K9 Trainer Mr. Jamie Gascon (former Marine, Police Officer and K-9 handler) to answer your questions and let you know what we would do if the dog were in the Training Academy here it PSD. Please feel free to submit your questions to PSD at PSDKennels@gmail.com We look forward to serving all your training needs!